The ultimate fluke rig! Two different color combination fluke rigs available in a size 2/0 hooks with a 40 lb. leader. 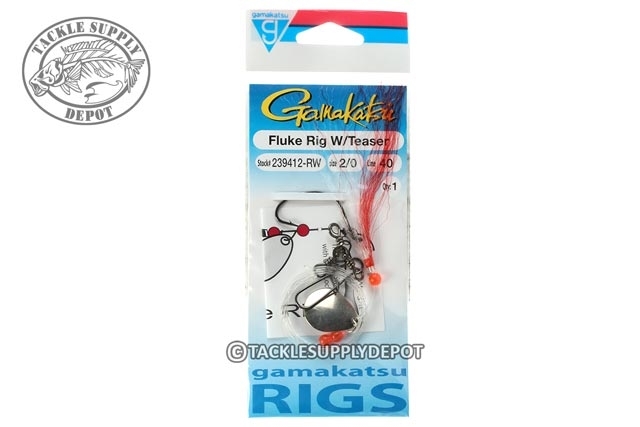 Gamakatsu's Fluke Rigs feature a spinner blade and a teaser made with synthetic hair material that is more tooth resistant and durable in saltwater. The teasers are available in either red and white or a chartreuse and white combinations with either red or green beads to match. They also feature a 3 way swivel with a crosslock to attach your weight.